Welcome to August, my friends! I feel like summer is definitely on the downhill slide. 🙁 This summer has just flown by for me – I’ve said many times lately that this has been one of the busiest times ever for us and July was no exception. If all goes well though, I’ll have an exciting announcement to share with you soon! A new Reader Appreciation Giveaway has started for the month of August for a $100 Pottery Barn gift card! Scroll down to the bottom for all of the details. 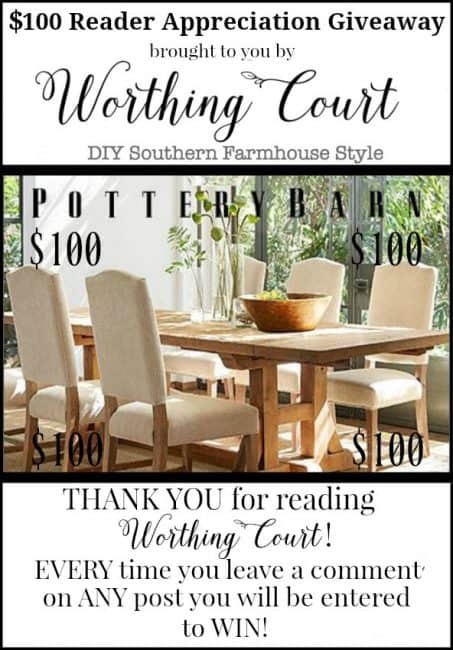 Did you know that I started a video decorating series on the Worthing Court Facebook page? I broadcast my very first video this past Friday and you can view it by clicking right HERE. I plan to make this a regular event, so you may want to follow my page to be sure that you don’t miss any future videos. You can follow my Facebook page by clicking right HERE. I’d love for you to let me know about any of your decorating struggles so that I can possibly address them in a future video! Take a look at what I was up to in July. No matter how dated or un-decorated, every home that I’ve ever been in is, I can always find a few features that are awesome and others that are well…not so much. The idea is to minimize the features that don’t make your home shine in the best light and maximize the ones that do! 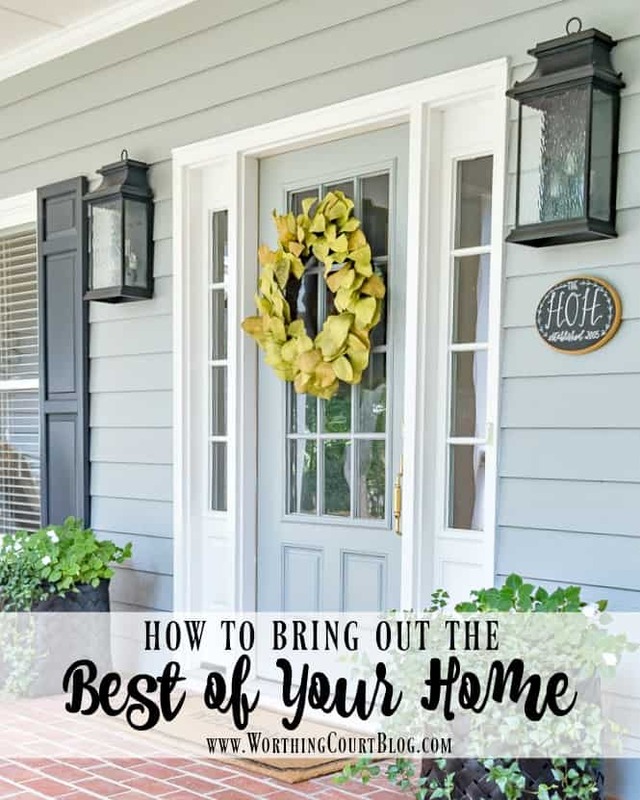 I’ve got five tips for how to bring out the best of your home, so that it will always put its best face forward. 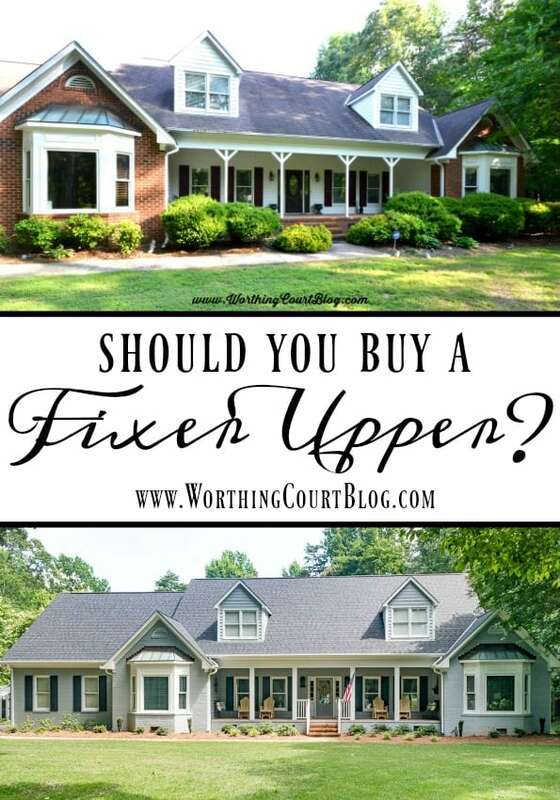 HAVE YOU EVER WANTED TO PURCHASE A FIXER-UPPER? If so, proceed with caution! Taking these considerations into account just might help you to make a decision. Late summer is when my thoughts start turning toward fall! I’m not quite ready to completely let go of summer – not yet. Instead, I’ll just pull out my faux green apples and a few wood elements to combine together to give me the feel of fall, but still say that summer isn’t quite over. Have you ever had the urge to give any of the rooms in your home a whole new look, but don’t want to go to the trouble or expense of a whole remodel? I’m right there with ya! I love the idea of being able to make small changes in a room, but wind up with a totally “new” space. 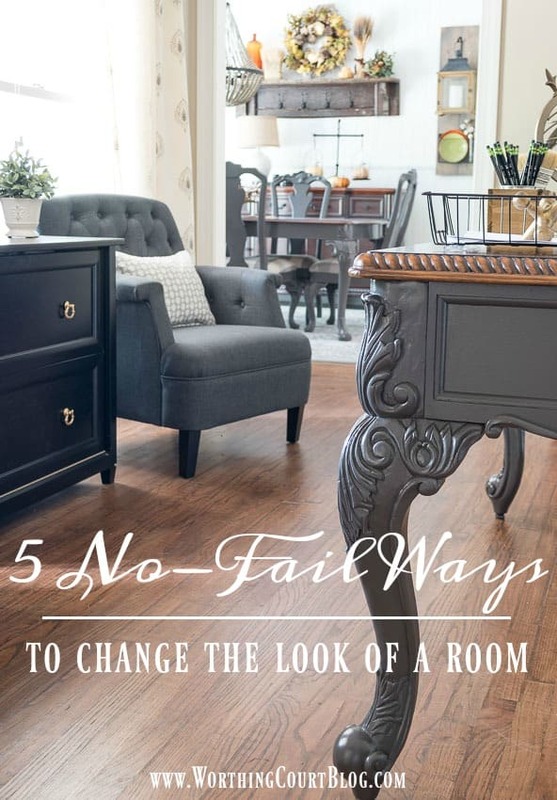 Check out these 5 no fail ways to change the look of any room in your home! Say you’re all ready to decorate a room in your home? 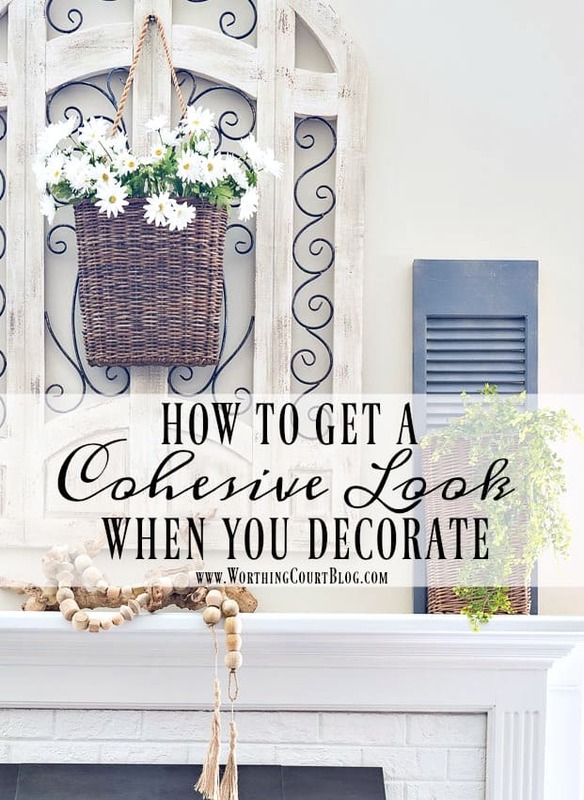 Use these tips for creating a cohesive look to help you get it right from the beginning. Or, maybe you’ve already decorated the room, but something just seems off to you. Often times, the problem is that while all of the individual elements might be pretty on their own, the room just doesn’t look pulled together. Make sure you read these rules for the Reader Appreciation giveaway! Remember – MORE COMMENTS = MORE CHANCES TO WIN! Love your blog and all your great tips and ideas!! Love your new video, your blog and all the wonderful work you do. Keep all the inspirations coming! I love having my coffee while reading your blog. Thanks for all the amazing ideas, especially like the painting of your dining room furniture. Love your blog. I’ve incorporated a few of your ideas. So many great ideas! I always enjoy your “tips of wisdom”. ? I love Pottery Barn and your blog!! I love your blog and look forward to your emails. I have learned so much from reading your blog! Thank you! Thank you so much for a chance to win Suzy, and I love your late summer thoughts, I can’t stop thinking about fall and pumpkins! It was fun to see your family room up close and personal. I love your hanging light fixture. It’s good to know others live with architectural challenges. Many of them become less bothersome as we focus on what we really enjoy about our spaces. Thank you for sharing your time and talent with us. I do like the soft greys in your home. Quite lovely. Love everything you’ve done to turn your house into a most comfortable ? I loved your FaceBook video! Good tips for sure. Your home is beautiful! Would love to win the Pottery Barn Gift Card!! Love your use of shutters throughout your home. It’s an easier way to add rustic charm that without having to cut up a pallet. Thinking about adding a pair to my foyer! I loved your ideas about transitioning your summer decor into fall without having to change a great deal. I don’t have ANY style sense. I like what I like and I love your style. I love to DIY it when I see something I like. Thank you for the inspiration. Love your blog!! You have a lovely home. Thanks for sharing and you certainly inspire me to try new things. Enjoy your day! I look forward to your email notifications! I always find something to take away from your posts! Wtha knyou so much for a chance to win! I love all your pictures, super inspiring to me! I love what you have done with your home it is so warm and inviting. I keep looking at your shelves in your dining room, they are just the right touch of industrial and farmhouse, I keep looking for a place in my house to try them. What you’ve done in your home is so inspiring! Love reading your blog. Always look to brighten my home. You have so many great ideas. i love the look of your late summer open kitchen shelves. A great giveaway. Very generous. Pottery Barn has a lot of beautiful things. This would be a great win. Great ideas and thoughts. Pottery Barn giveaway is a wonderful addition..
Love the decorating ideas! Thanks for sharing! I am really behind in reading your posts! And scrolling through this post I see a lot of things that interest me. I love your style and your inspiration for making our homes look the ways that please us. Now, I better get busy and read those “missed” posts! as always, love your blog. full of beautiful ideas and tips. and best of all – affordable! thank you! My sister just introduced me to your blog. I’ll visit it often. Thanks again for another opportunity to win! Redecorating my bedroom so I could definitely use the gift card!! I love your blog..your home is so welcoming..my favorite post is your daughter’s wedding day at Worthington Court! Thanks for the chance to win a gift card from Pottery Barn ! Another great giveaway! Thanks for all of your ideas to make the most of our home decor! A cool blog and a cool give-away!!!!! I love reading your blog. You have given me so much inspiration for new ideas in our home. I would love to win the Pottery Barn gift card. I get emails from them and have my eye on a few items that I would love to acquire. The gift card would really help. Love your blog and Pottery Barn!! Love all your tips and ideas. I just listened to my first podcast and enjoyed it so much! Can’t wait to explore your blog! I really love what you have done with the old sideboard. The plates, the candlesticks and the pig wreath above it – perfect for a farmhouse or a city home leaning toward a country look. So cool to watch your video and hear your voice…love your Southern accent. I’m from the Midwest, so I don’t have one…ha ha. I look forward to reading your blog and enjoy seeing how you decorate your lovely home. Can you use the same concepts for a traditional decor? I love the farmhouse style but my home is traditional. Someday I would like to have our closet doors replaced. All of ours are bifold which is a waste of storage space that could really use! Love your ideas for creating a fall centerpiece. The scoop has some good ideas, love the refinish on your desk and table. The thought and time you put into your home and your blog makes reading it so worthwhile. Thanks for all the usable ideas! I enjoy your blog and love your style! Wow I love all the ideas & tips to make a room pop! Love to try the 5 NO-FAIL WAYS TO CHANGE THE LOOK OF A ROOM great way to change the place up without spending a ton. Thank you for sharing. Your ideas and photos are so helpful. Thank you. You have done a great job with your home, it’s lovely. I look forward to all of your decorating tips. I love every room! I’ve been getting caught up on your blog and already see some things I want to incorporate in my home. Thanks! Would love to win the Pottery Barn gift card. Love your tips on achieving a cohesive look. Really, I love all your tips. I always look forward to reading your inspiring posts! I’ve been eyeing a few things at Pottery Barn recently so thank you for the chance to win a PB gift card!! Oh, the fun I could have!! I love your style and your tips to achieve it. We’ll be moving into a new home soon and I’m struggling with how to fill the spaces. I’m studying your posts to help me. I’m so glad I found you! Loved the video of your beautiful kitchen. Look for word to seeing more videos. Such a warm inviting home. Your posts are so helpful and inspirational. Thank you! Wow, videos are a great idea. I am looking forward to them since I’m such a visual person. Thanks so much for the inspiration! I look forward everyday for your Blog and decorating ideas. love your blog. you have inspired me recently in a way that has not happened recently! You have done an awesome job updating and decorating your home. I loved your first video and the fact that you let us see everyday, blankets on end of sofa, doggie toys–life. I am totally inspired by your decorating for last christmas. I can’t wait to start christmas decorating, I am going to copy as much of yours as possible. Love your blog Suzy, I always learn so much! I love the lanterns in your dining room. Would like to do something similar. My birthday (73) is in a few weeks, hoping my family takes the hint. Really liked the article on buying a fixer upper. A lot of great advice. Your front porch looks so inviting. I love the simple wreath on the door. Anxious to see your fall decor. I love the simple addition of the green apples. Such a nice pop of color! I look forward to reading your blog and re-reading ideas too!! I love your decorating style and ideas! They have given me a lot of inspiration. 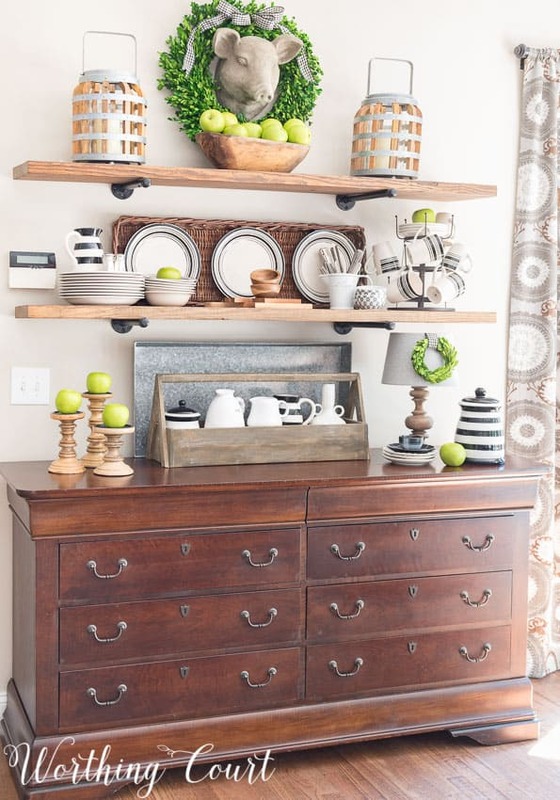 Love your open shelving decor! Not too overdone for August, just right! Love all of your tips and the blog!
. Your home is beautiful. Hi Suzy this is my first time on your blog! I love your late summer into fall ideas. Love those green apples! All those posts look so interesting and helpful and I’ve gotten behind in my reading! I love your style and the way you combine elements to make a lovely and cohesive look. I get so much inspiration from your blogs. Thanks for the Fall inspiration! Thanks again for the chance to win! I would love to use the Pottery Barn gift card on my master bedroom makeover! I love following your blog. You have the most clever and beautiful ideas. I’m so excited for Fall decor. Love your posts and love your home! I really enjoy your posts because they are so pretty and I look forward to the different seasons you feature. Thanks! Thank ou for all the great ideas and inspiration. Looking forward to your upcoming posts for the Fall season. Love, Love, Love your blog. You fill my head and home with such great decorating ideas. Would love to be picked for the Pottery Barn gift card. They feature so many things I love. I was a past winner of the Pottery Barn GC. My beautiful pick stitch quilt is a testimony to that 🙂 Suzy, your blog with your many tips, ideas, advice evidenced in your beautiful home is a blessing to more than you could ever know. Keep all that good stuff coming and may the blessings come back to you 100 fold. One of my favorite of your posts is your painted desk. Love it. I’m so thrilled to have found you! Recently signed up to follow your luscious blog & looking forward to reading all your ideas on a regular basis! I’m so excited about the addition of video to your blog! Great idea. Love the green apple idea! Simple yet beautiful. ? Hi there. 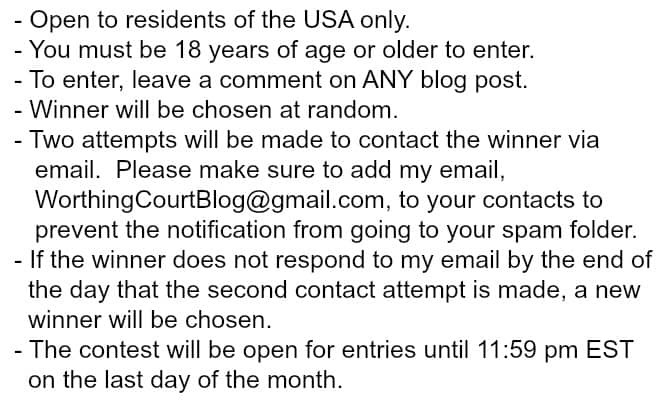 I Love your blog and your decorating skills, tips and tricks, but I just wonder why we Canadian subscribers are not allowed to enter your contests. I see others that allow everyone of their readers/subscribers to enter? Thank you. Hi Stacy. I’m sorry – I just haven’t had time to check into the logistics of it yet. 🙁 I’ll make it a priority to see what I can find out though. Really enjoy your blog. Your home looks very warm and inviting. Thank you for your inspiring ideas. Love them. I just found a pair of old, wood, kinda small shutters at a yard sale. I bought them because I recall seeing how you used them in your home. I hope I can incorporate them into mine. Hi, I love all your ideas for a comfy home and especially your budget tips! Love your blog, I save and re-read all of them! We purchased a fixer upper lake house and it is keeping us busy. We love it and will retire there in a couple of years. I have several pieces of pottery barn furniture and need a few more! I love your blog…I am a newbie, but love your advice and ideas! So many great idea’s! Thanks Suzy!